Can you believe that Goddess Jennifer Aniston is 49?? She looks like she should be 35. Goddess Jennifer Aniston turned 49 this past Sunday, February 11th. But she celebrated with a close group of girlfriends such as Courtney Cox, Aleen Keshishian, Andrea Bendewald, Kristin Han and many more. The Girls celebrated Aniston's birthday in Malibu California in Courtney Cox's house. Many of Jennifer's friends took to instagram to wish her a Happy Birthday. People are also spreading rumors that once again her marriage to Justin Theroux is over simply because he was in New York and didn't publicly send her a Happy Birthday wish. People really need to get a life not everyone does everything publicly Justin has always been a very private person. Jennifer Aniston celebrated her birthday with her closest Friends. The actress turned 49 on Sunday and marked her special day with a lunch in Malibu, California. Aniston was joined by pals Courteney Cox, Andrea Bendewald, Leigh Kilton-Smith and Kristin Hahn. 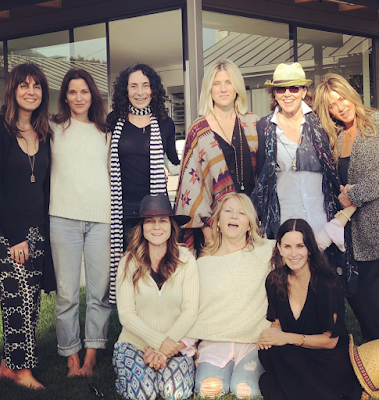 Aniston’s manager Aleen Keshishian shared a snap of the girls’ day out on Instagram Monday.“#happybirthday to my sister from another mother #jenniferaniston [heart] u so much!” wrote Keshishian, who also represents Aniston’s closest friends Jason Bateman and Gwyneth Paltrow.“We love our Jen. magical Malibu day. I love that this is taken by the kiddos!” author Mandy Ingber also shared on Instagram.